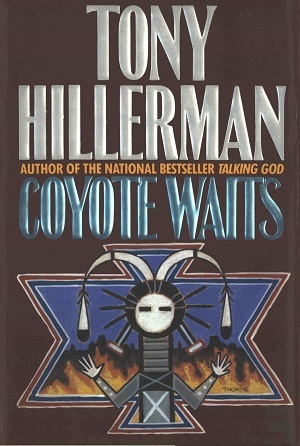 This is the second edition of Coyote Waits, which is the tenth Tony Hillerman Navajo mystery novel. This edition was published in 1990 by Harper & Row Publishers in New York City, New York. This edition lacks all purchasing information and ISBN number and appears to be a copy for promotional use. The cover art was designed by Peter Thorpe, who designed a majority of the Harper & Row editions of the Tony Hillerman covers. The cover art depicts a Yeii figure with a fire blazing inside a geometric pattern in the background. Binding: Maroon boards with black covered spine. The author, title and publisher are printed vertically in silver on the spine.